Residential electrical conduits may be Romex, rigid metal conduit, armored cable conduit, or PVC conduit. Local building codes will spell out requirements during a remodel project or new construction. The electrical current that supplies power the home enters at one location. Its then distributed through the residence from the fuse box, circuit breaker box, or electric service panel. The gauge of the wire bundle and the conduit which contains it is spelled out by your local electrical building code. An option is to go above and beyond mandated requirements, which you will appreciate further down the road. Nonmetallic Cable (NM cable or Romex)The most common wiring cable youre likely to encounter. This is specified for almost all applications, is easy to work with, and is very affordable. Upgrades from Romex are widely used in commercial work, on exterior lighting and buried: armored cable, metal conduit, as well as PVC conduit (great for landscape lighting). Always check your local electrical building codes and pull the required permits; some municipalities now require using armored cable conduit rather than Romex, although its more common in commercial construction. Its a good upgrade; the price isnt much more, and its much safer than Romex. Armored cable is really just coiled metal sheathing with the wire bundle inside. Its almost as flexible as Romex, however it protects against nail punctures when hanging drywall, hammering in nails to hang pictures, and other mishaps. To work with and cut armored cable, bend it smartly until its coils begin to separate. Then, carefully twist the coils apart until enough wire is exposed. Use straight-cut aviation snips or side-cutters to cut away any excess cable. Usually commercial construction comes to mind when thinking rigid metal conduit. But as a matter of fact, its a good choice for residential wiring in areas such as attics, garages, basements, as well as crawlspaces. Mice are fond of chomping on electrical wires in these spaces but that is not really a very effective means of pest control. Rigid metal conduit will bring this destructive behavior to a quick end. Working with rigid metal conduit is a bit different. 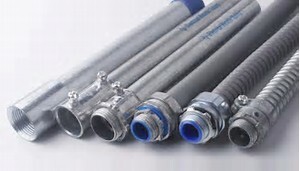 Youll need a commercial conduit bender, offset fittings, conduit couplings, and elbows. Its also different from armored cable in that metal conduit doesnt come from the manufacturer with the wire bundle factory installed. The wires are pulled through the metal conduit manually after the conduit is installed. PVC conduit is just the ticket for home exterior applications. Its very versatile considering the broad range of connections available. Assembling a PVC circuit is similar to a plumbing project. The difference is that the goal is to keep the water out, rather than in! So hows it assembled? PVC conduit is rough-cut using your hack saw. Then the conduit lengths and fittings are connected using PVC primer and glue to achieve a waterproof conduit. Which applications favor PVC use? Two places leap to mind: outdoor lighting and buried underground. The benefits gained in either area are first waterproofing, and secondly having confidence in a non-rusting material. In conclusion, the methods of channeling electrical transmission in the residence is dependent on several factors: local building codes, the environment, economy, and of course, safety. If youre not comfortable doing the work. find a licensed electrician in your area, check out Angies List.